Happy and Glorious-A Day To Be Proud To Be British! So after my post the other day, I promised myself I wouldn’t blog about the Olympics again until after the games was over. However, my excitement got the better of me after yesterday’s phenomenal day for Great Britian – 6 Gold medals and 1 Silver, 3 of those Gold coming from Track and Field Athletic events! It was just such an incredible feeling and so emotional to be watching this day unfold, and be apart of an event that will certainly inspire a generation – or perhaps generations young and old. This Olympics has been a constant build up since the day we found out we had won the bid to host. At times there has been criticism over certain choices the games organisers have taken (that Logo for instance). But I think it’s fair to say that ever since the games have started, this country has felt nothing but insane pride at what we have achieved – from the opening ceremony, to the Olympic park and all the venues that have been invovled, to the thousands of volunteers, whom the athletes have praised for their hard work and utter friendliness throughout. The pride that we felt at the Opening Ceremony has swelled with our success in the games on a sporting level, with athletes commenting on the home crowd support, often referring to it as ‘overwhelming’. Indeed even witnessing it on the tv is giving me goosebumps, and I can only imagine the positive atmosphere that is around London. Yesterday, I actually got to experience a small chunk of the atmosphere courtesy of my partner in crime, the one blonde Kat! Part of the Olympic football is happening in Newcastle and a spare ticket was going and I jumped at the chance to be apart of a slice of history. I admit even though I never went for tickets when they were on offer, I do wish I had done, just so I could be apart of it (although thanks to the BBC’s coverage I do feel very involved). The atmosphere at St. James’ was incredible, a sea of colour and brightness, with music playing all around the stadium and an overwhelming amount of support for both countries playing (neither of them were Great Britain) Brazil vs. Honduras was a nail-biting game, and for me that is saying something, considering I am not a fan of football most of the time, something which I openly admit. I’ve been so amazed at the level of home crowds that the games have drawn, lining the streets of London for the marathons and cycling road events, and I was so pleased at the level of nosie that erupted from the stadium yesterday. There was a lot of Brazilian support across the stadium, but I like to think the crowd got behind Honduras as well, the underdogs going into the match. And who doesn’t love an underdog – I know I certainly do. The match ended 3-2 to Brazil, and Honduras put up a brilliant fight, faced with a ref who loved his yellow cards, and perhaps favoured Brazil slightly too. But I was so incredibly pleased to be there, in a fantastic atmosphere and it really summed up to me that these games have producted a nation that is united! My final point about yesterday goes back to what I was saying in my previous post about the expectations that have been put on British athletes to perform. Yesterday we saw the ‘face’ of the games Jessica Ennis achieve her dream of a Gold medal in the Heptathlon, rising above the immense amount of pressure she has been under. Even in her interviews after the last event, she stated the pressure had been intense but that she had simply ‘focused on what she knew she could do’. However even though yesterday saw some incredible moments there was some moments that were quite painful and heartbreaking to watch. 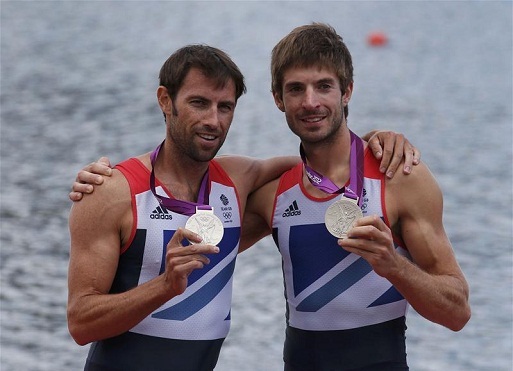 The rowing pair of Mark Hunter and Zac Purchase, who were Olympic champions in Beijing had much expectation and were unfortunately pipped by Denmark who had an outstanding last 500m. Still the pair were Silver medalists and they absolutely gave it everything – physically, mentally and emotionally as we saw post-race. Viewers saw as the British pair slumped in their boat, tears falling as they look simply exhausted. Indeed Sir Steve Redgrave went down to the dock to help hold Mark Hunter up. As the rowing pair continually apologised, saying they had let people down, it really was a heartbreaking moment – these boys had let no one down and they had done us proud! Anyone that said otherwise clearly did not see how utterly exhausted these two boys looked. I was swelled with pride at these two men, who in my eyes, were winners in their own right. Indeed the BBC commentator John Inverdale could not hide his emotions after the interview, as he was visibly close to tears. Sir Steve Redgrave has also been a constant at the rowing finish line with Inverdale and it’s truly lovely to see him greet every British athlete with a massive hug. It’s truly beautiful (and proves what a softie I am) Indeed, a friend summed up the role of Sir Steve as like the ‘Dad’ of Team GB – and for rowing that certainly seems the case. Another moment like this was the post race interview from the Swimming girls 4×100 medley team with Sharon Davies with Fran Halsall apologising for not being unbelieveable when the crowd had been. Davies immediately came back with ‘that’s not true’ and whilst she was mostly off camera, viewers soon realised that Davies was in tears, with Halsall hugging her and Davies struggling to get the words out for her next question. In moments like this you realise how close these commentators are to the athletes in the sports they cover. Overall, yesterday was a day to be immensely proud of. And for me it was in more ways than one. I was proud to be a part of this historic games, and period for this country – a games which proves to the world that we DID deserve to host these Olympics and that we still are a great nation! I was proud of our amazing athletes, athletes that I don’t think get the credit that they deserve a lot of the time. I was proud of their determination, their stamina, their resiliance and just utter talent. And lastly I’m proud to be British. So, the Olympics are upon us and can I just say I am loving them this year! Every day I’m glued to the tv and to the BBC’s incessant coverage. relishing in every moment of it. I always enjoy them whenever they come around as I enjoy seeing the sports that we don’t often get to see. I always say it and it may be part of the reason I don’t particularly like the sport, but this country puts far too much emphasis on football, even though we never seem to get very far with it. Whereas you look at sports such as Rowing and Cycling, where a lot of medals have come from this year, sports that we never hear much about it. I just thought I’d post my views on the pressure of being an Olympic athlete -a pressure that surprise surprise is mainly coming from the media. The media have their favourites – their poster boys/girls that they tend to hone in and focus on to ‘bring home the gold’s for us’. But sometimes things don’t always go to plan. Mark Cavendish for instance -a fantastic sprinter and cyclist unfortunately was out of the hunt for a medal and he blamed other countries tactics after the race. Other times things do go to plan – Sir Chris Hoy yesterday rode to his fifth Olympic Gold medal equalling Sir Steve Redgrave’s record. But wait a second, there was also two other guys in the team pursuit that helped him bring home the gold – Philip Hindes and Jason Kenny. Such a shame that the media don’t really mention them and they tend to show pictures of Hoy rather than all three men. But then this tends to be the case for a lot of things. Prime example number 1 goes to Tom Daley – the media’s no. 1 poster boy. Young, good-looking and he can dive as well! Now I’m not a massive fan of Tom Daley and I don’t really get what all the fuss is about but, I’m not taking that away from the fact he’s obviously a great athlete. The media kept re-iterating he would be going for the gold in the synchronised dive earlier this week. But, wait a second. Synchronised? Doesn’t that imply he has a partner. Step forward Pete Waterfield -Tom Daley’s unsung partner. In the 2002 Commonwealth games he won the gold medal for the 10m solo dive and then 4 years later won the silver medal. However the poor guy has had to contend with being an afterthought in the media’s love of Tom Daley, with a constant barrage of Daley love, you have to feel sorry for him. Now I’m not naive enough to think that the media don’t focus on people that aren’t ‘deserving’ to be focused on – however in team events, surely it’s about the team effort not about the individual? Cyclist Chris Froome has had a fantastic year -2nd in the Tour de France and a bronze in the Men’s Time Trial, and all the time supporting his Team Sky and fellow GB teammate Bradley Wiggins. Something which has angered me to no end has got to be the mantra that ‘Nothing but Gold is good enough’. After the first couple of days of having no Gold medals, we constantly heard about it from the BBC commentators -when will our first Gold medal come? It didn’t matter that we had already got a bronze medal in men’s team gymnastics – something which hadn’t happened for 100 years. When the Gold’s started to come through, suddenly it didn’t matter so much about the other medals we were picking up. They were seen as an casual afterthought. Not again I understand that the goal is to ultimately WIN and that’s what these athletes come here to do – but ultimately every athlete and team have a goal and an objective that they want to try and achieve. Ultimately though, goals and objectives sometimes have to be changed or re-thought. I come to the main point of why I decided to write this post (or rather semi-rant) Rebecca Adlington – double Olympic Gold medalist at Beijing, who was fully expected to try and equal that again this time around. When Adlington qualified last for the final of the 400m freestyle despite winning her heat the BBC was then forced to backtrack claiming that it wasn’t her stongest forte. When she won the Bronze medal Adlington was ecsatic and so were we-obviously remembering the information the BBC had fed us. The commentators re-iterated that the 800m were still to come and we waited anxiously for tonight’s final. The BBC hyping it up as a two horse race between Adlington and Danish athlete Lotte Friis. Out of no where a 15 year-old US swimmer Katie Ledecky made a go for the gold – leading from the front pretty much from the outset, swimming under world record pace for the majority of the swim and Adlington just couldn’t catch her up, ultimately winning Bronze for Great Britain. You could obviously see the frown on her face after the race had ended, possibly a sign of her frustration but ultimately she had won another Bronze medal at this Olympics – a great achievement! However, this soon appeared on the dedicated BBC Olympics page. The quite frankly disgusting headline of ‘Adlington beaten by US teenager’ makes it sound like she achieved nothing in the final – frankly an extremely negative viewpoint. The BBC commentators were forced to apologise after the match in case their comments sounded ‘negative’ pointing out they were disappointed for her (something which is probably true). Even tonight’s BBC report questioned whether the expectation and pressure was too high, and Adlington even mentioned that herself after the race. This could perhaps be a wake up call to the media -a signal that putting full page pictures of athletes on newspapers, with headlines proclaiming their success, before the actual event, is too much pressure and perhaps causes a negative effect. This Olympics so far is proving to be an extremely successful one: After Day 7 we are 4th in the table with 8 Gold medals, 6 Silver and 8 Bronze medals – a total haul of 22! We’re already up on this time last year and we still have a lot of events still to come to add to our success. The media need to remember, that this country is proud of every single athlete taking part in this Olympic games -our Olympic games! The support of the British crowd is phenomenal, and we need to see that when we do win a medal -whether that is a Gold, Silver or Bronze it is a medal to be proud of and not something to be ‘disappointed with’! Danny Boyle = wow! What a show he put on. This man deserves an award – can you be nominated for an BAFTA for that? Although it wouldn’t surprise me if he ended up on the Queen’s honours list at New Year. What a genuinely entertaining, beautiful, and dynamic show -well and truly British to the end! Brava Danny Boyle! 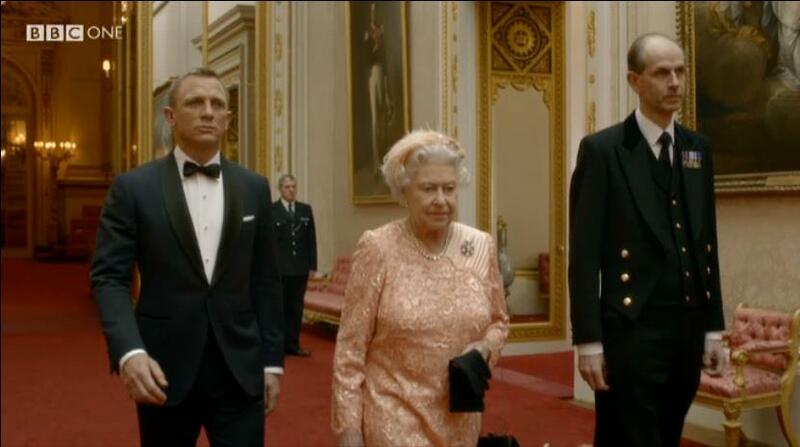 James Bond and The Queen – Words cannot describe my reaction to this. I first heard a rumour about this a couple months ago and I prayed it was true and low and behold here it was happening in front of me. Kudos to Boyle and his team gaining access to the Buckingham Palace and the Queen for going along with the sketch. Truly brilliant! Giant Voldemort/Cruella De Vil and dozens of Mary Poppins – enough said really. Fantastic display of some of this countries literary greats. Great to see J. K Rowling as well! Move to the Beat – Even though the story within this was a little boring, it was great to see a fantastic mix of music that has come from Britain and influenced several generations, and will influence in years to come. THAT Cauldron – so breathtakingly beautiful. As all the separate branches rose up to make one cauldron, I had goosebumps. Beautiful creation. A true testament to unity. Paul McCartney – what a way to end the night but with Paul singing ‘Hey Jude’. He looked visibly moved to be there and it really was the best way to round up the evening. The Games have now officially opened and I’m very much looking forward to keeping up with the action! I always love the Olympics whenever they come round and this year is definitely no exception! Happy Olympics Everyone! Leave your own comments about the ceremony and what you thought!